It struck near Zanbaq Square in the heavily fortified zone, with civilians said to be the main casualties. The morning rush-hour blast was so strong it blew out windows and doors hundreds of metres away. The Taliban have denied carrying out the attack. There has been no word so far from so-called Islamic State. Both groups have been behind recent attacks in the country. The BBC has said that Mohammed Nazir, a driver for the corporation’s Afghan service, died in the explosion. 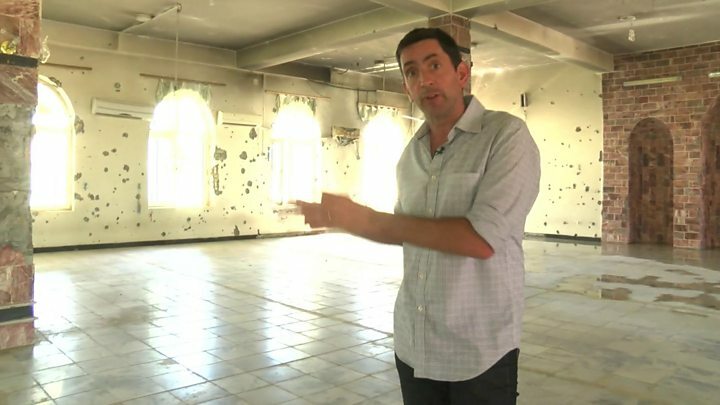 When and where did the attack take place? 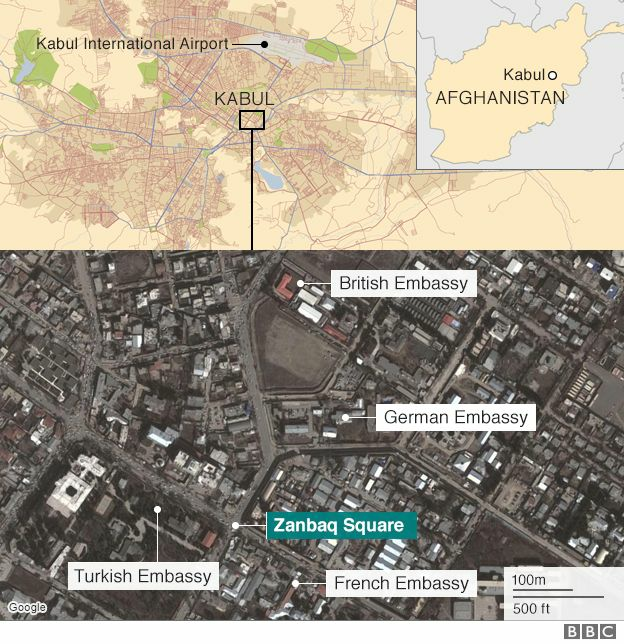 The bomb went off at about 08:25 local time (03:55 GMT) during rush hour at the diplomatic quarter. 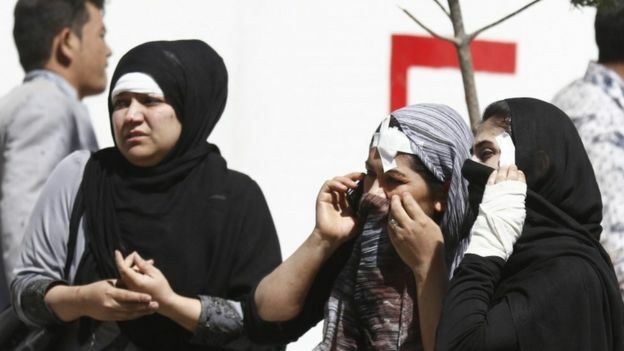 Makeshift ambulances carried wounded away from the scene, as frantic relatives gathered both at the cordoned-off perimeter of the blast site and later at hospitals to try to locate loved ones. Images showed dozens of blackened and burned out cars. More than 50 vehicles were destroyed. 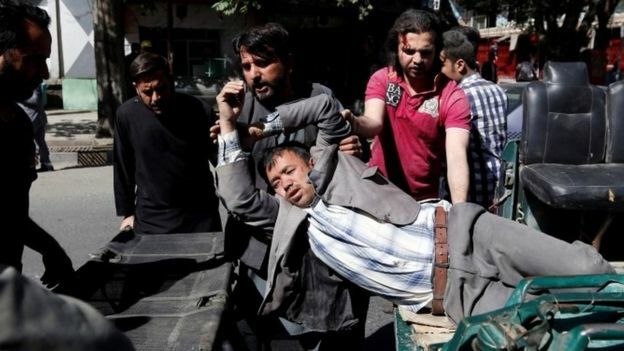 Basir Mujahid a spokesman for Kabul police, told Reuters news agency the explosion had taken place close to the German embassy but added it was “hard to say what the exact target is”. There are many other key buildings in the area, including the presidential palace and a number of embassies, including the British. Some reports say the bomb was in a lorry or water tanker. 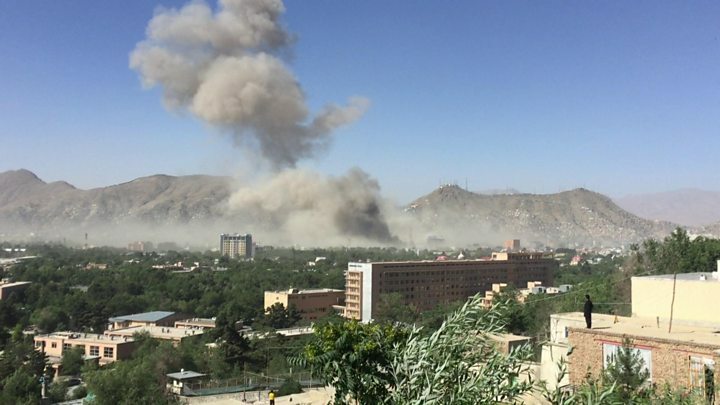 The BBC’s Harun Najafizada in Kabul says questions are already being asked about how the vehicle could have penetrated such a heavily fortified area, with its 3m (10ft) high blast walls, to carry out the deadliest attack in the capital in years. Initial reports suggest civilians bore the brunt of the casualties. The health ministry said the casualty figures were expected to rise further. The interior ministry has called on residents to donate blood, saying there was a “dire need”. Another resident, Abdul Wahid, told the BBC the blast “was like a heavy earthquake”. 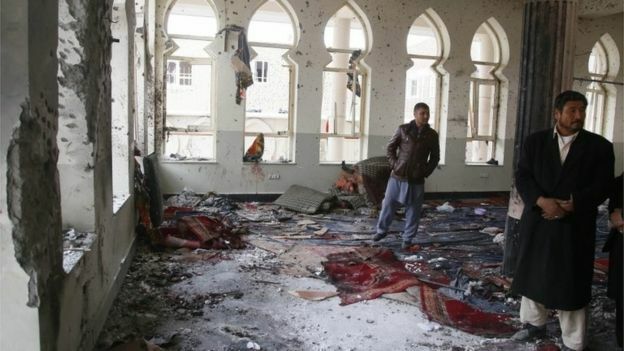 Afghan President Ashraf Ghani said he “strongly condemned the cowardly attack in the holy month of Ramadan targeting innocent civilians in their daily life”. Germany’s Sigmar Gabriel called the attack “contemptible”. Who could have been behind the attack? The Taliban and the so-called Islamic State in Afghanistan are the main suspects. However, the Taliban quickly issued a statement denying involvement. Spokesman Zabihullah Mujahid said the group condemned untargeted attacks that caused civilian casualties. Afghanistan’s IS said it was behind a suicide bomb attack this month on a Nato convoy that was passing the US embassy in Kabul. At least eight civilians were killed. It has made no comment so far on the latest attack. When announcing the start of their major spring offensive last month, the Taliban said their main focus would be foreign forces, targeting them with a mix of conventional, guerrilla, insider and suicide attacks. The US has about 8,400 troops in Afghanistan, with another 5,000 from Nato allies. The Pentagon has reportedly pressed President Donald Trump to send thousands more troops back to the country to try to counter gains by the Taliban. More than a third of the country is now said to be outside Afghan government control. A Taliban attack on an Afghan army training compound in the northern city of Mazar-e Sharif last month killed at least 135 soldiers, and led to the resignation of the defence minister and army chief of staff.